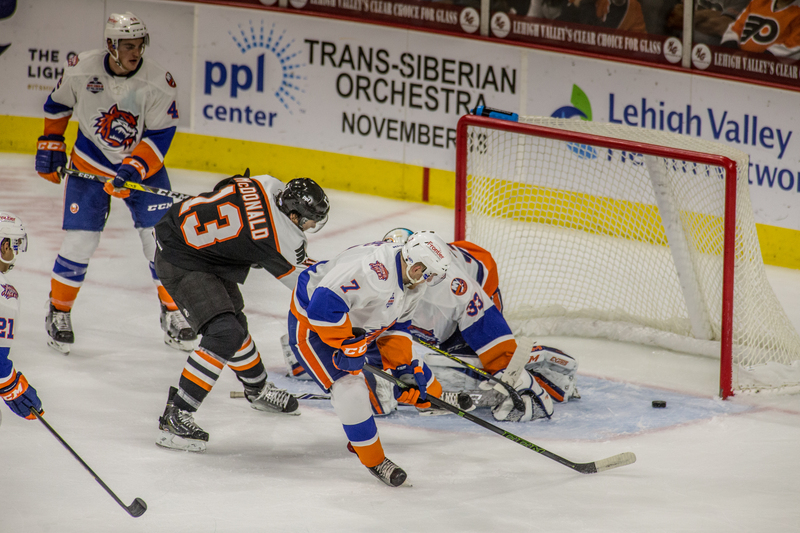 The Phantoms went into the holiday break on December 17th having won five in a row. 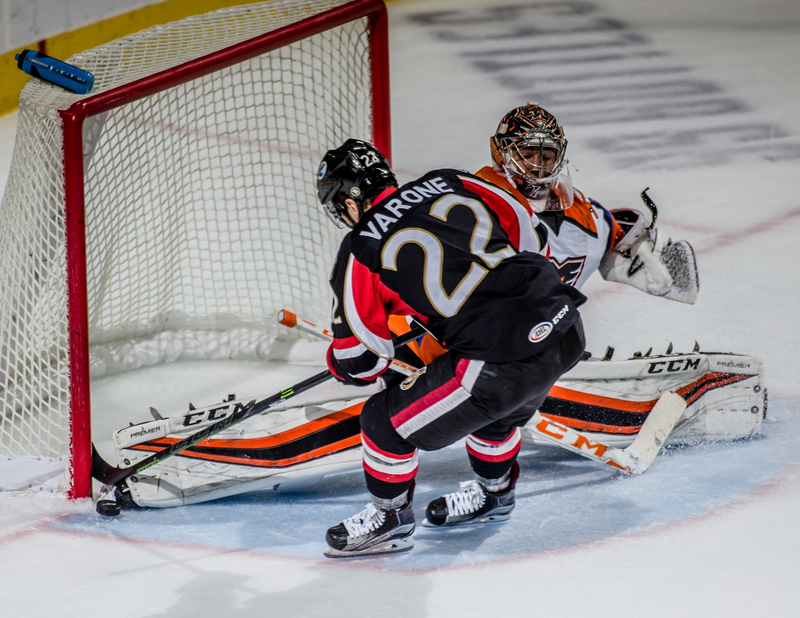 They return to the ice tonight at the PPL Center to face off against a Hershey squad who have gone 3-3 (3-1-1-1) over their last six. The last two games with the Phantoms have been close: A shootout win for the Phantoms and an overtime win for the Phantoms. The season series with Hershey stands at 3-2 if you’re the Phantoms, and 2-1-1-1 if you’re the Bears. The Phantoms lead the league in wins and are tied for the most in points. They also are near the top in goals scored and Power Play. Not much player movement of late, as would be expected on holiday break. The Flyers have had an injury or two, but should also be getting guys back. Reading suffered a goalie injury, but until Stolie comes back, we keep Ouellette. We continue to await the return of defenceman Mark Alt, from shoulder injury/surgery. Lines have been fairly stable through the current 5-game streak. Thee top line has been formulated for maximum responsibility, but will need to contribute to the scoring as well–especially Laughton. All four lines continue to score goals–the second line is the “young” line, the third line is the veteran line, and the fourth line is the scrappy line. The Sanheim/Morin pair continues to remain intact. It’s interesting to now see Hagg paired with TJ while O’Neill takes Lamarche or Willcox. The Royals went into their break with a win on Friday at the Santander. This was good after having lost three in a row. Reading is currently fourth in the North division. Expect another closely played contest between the intrastate rivals as Hershey returns to Allentown to face the Hamilton Street Heroes. Tickets: This game has gone “SRO” with general admission tickets now available. There are also seats available on the secondary market. I’d advise procuring your tickets before going downtown tonight. PreGame: Listen to the radio pre-game show on AM-1470 starting at 6:20PM as you head downtown. Catch the TV pregame at 6:30PM on TV-2 or Live at Chickie’s and Pete’s. Two weeks ago, Mrs. Kram and I returned to ROAR for the first time in a while. They’ve tweaked their menu a bit since I was last there, but we still had excellent food and service, and some very nice cocktails. Watch the play of Robert Hagg. He’s been really solid lately. Watch how he works with Brennan. Watch to see if they have any jerseys up for silent auction; they must be about out of those pre-season orange jobs by now. Stop by the Phan Nation table on the concourse (section 103?) and say hello to those folks. Join. They have T-Shirts and Pins and sometimes a raffle. Good stuff. The Phantoms go on the road for two in Rochester to close out the 2016 calendar year. You can catch Wednesday‘s game at Chickie’s and Pete’s as the Phan Club hosts an “away viewing party.” All are welcome. They’ve got a road game in Hartford on the 6th, and will return to Allentown for a Saturday-Sunday set with North Division teams Albany and Utica on January 7th and 8th respectively, for Girl Scout Night and Star Wars Night. The next giveaway is a T-Shirt on January 13 vs Hershey. cover photo by Cheryl Pursell–from seasons gone by.